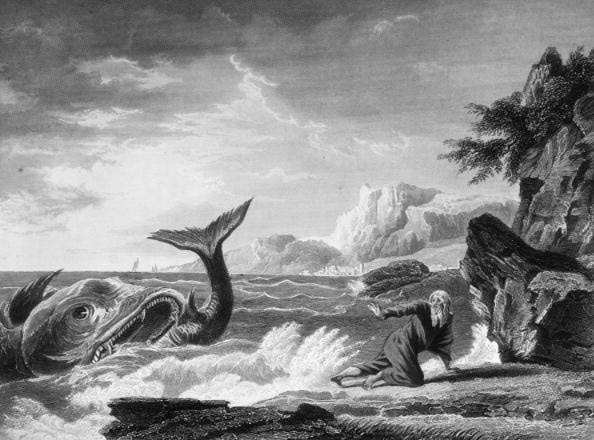 This is the classic story of Jonah and the Whale that pretty much everyone has heard once or twice in their lives. I love how the Lord had the whole thing planned and while we don’t know if Jonah was in the whales belly or if this entire story is a metaphor… it doesn’t matter… because we learn some great information. We learn that the Lord has a great plan for us and while Jonah cried from the depths of hell, the Lord listened to him. Often times we are in similar situations and feel trapped, like the waters have encompassed us and we can cry out to the Lord and he will save us… he will LISTEN to us even in the darkest of hours! The word of the Lord comes to Jonah (who was the son of Amittai) and Jonah is told to cry against Nineveh. Instead, he flees on a ship going to Tarshish. This angers the Lord and he sends a great storm to catch up to the ship. As Jonah sleeps, the mariners cast lots to ascertain who is responsible for this great storm; they find out that it is Jonah. Jonah suggests that they throw him overboard. The mariners are reluctant to resort to this extreme measure, but do so when the storm does not quiet down. As the mariners throw Jonah overboard, they pray that they may not perish because of Jonah. This entry was posted in Jonah, Old Testament and tagged Amittai, Fish, God, Great Fish River, Jonah, Lord, Nineveh, Tarshish, Whale. Bookmark the permalink.